Blue sapphire engagement rings were popular long before Price Charles gave one to Lady Diana upon their betrothal. That particular ring was handed down to Prince William, who gave it to his bride-to-be, now wife Kate. Many replicas have been made of that ring. Of course, these are glass and do not have any real market value. However, if you are true fan of the Royal Family, you would be very proud to own one of these mementos. Especially if you are one of the billions of people that still mourn the death of Diana the way billions of others mourn the death of Elvis Presley or John Lennon. A Blue Sapphire or a Piece of History? That is one of the best things about fine jewelry. You own a piece of history and no matter how old it gets, it never loses it's charm, elegance or beauty. 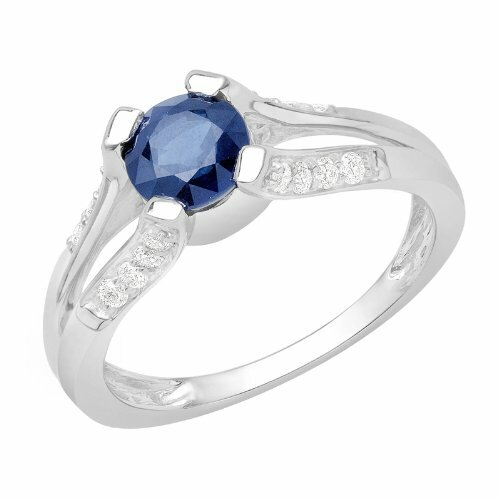 In fact, there is a huge market for vintage and antique jewelry, especially blue sapphire engagement rings. The word sapphire comes from the Greek word sappheiros. Undoubtedly, sapphires are among the most beautiful of all precious gemstones. Depending on who you ask, many people would say THE most beautiful. Diamonds get most of the lip service as being the most beautiful and coveted, but the only thing that sets them apart from sapphires is that they are a tad tougher. On the generally accepted hardness scale, Moh ranks sapphires at 9 and diamonds at 10. But, when it comes to glamor, shimmer and sparkle, you would be hard pressed to tell one from the other. Most people believe diamonds are white and sapphires are blue. This is true, but many diamonds are blue and many sapphires are white. Only a trained gemologist can tell them apart. Both diamonds and sapphires grow naturally in various colors such as purple, pink, orange, yellow, green and violet. Gemstones can also be artificially colored. These are every bit as beautiful and glorious as the ones that grow naturally in these colors, however they are priced somewhat lower because they are not considered rare. Rarity is what really cranks up the price of everything, and gemstones are no exception to this rule. Since ancient times people have believed very strongly in the power of gemstones. The phenomena of something so glorious coming right out of the earth had to be a gift from the Gods. And as special gifts from the Gods, naturally they must be magical and hold mystical powers. Every gem is associated with its own set of myths and legends. Even the different colors represent different meanings to different cultures. Of course, that is true with the color itself, but when the color is in the form of a remarkable gemstone, its power doubles, or even triples. For example, blue is associated with faithfulness and loyalty – true blue. These traits are seen as even more prominent in blue sapphires. 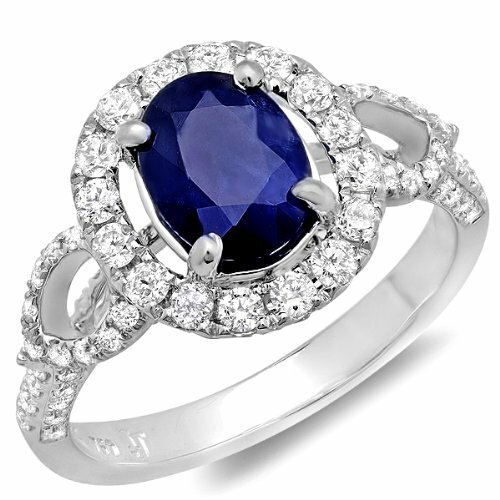 That is one of the reasons why blue sapphire engagement rings have become so popular. 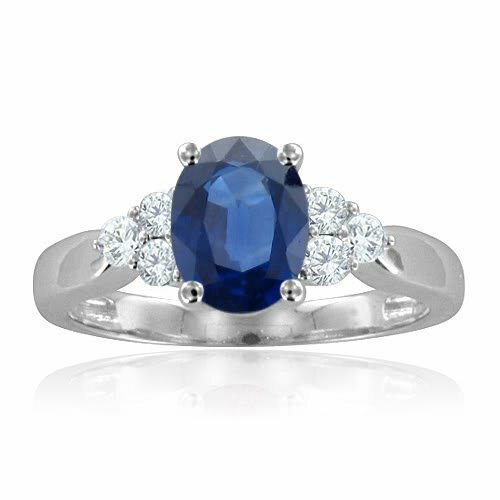 Giving your betrothed a blue sapphire engagement ring represents that you intend to be true, faithful and loyal for life. Of course, this didn't happen in the case of Prince Charles, but he probably did have those intentions when he first gave Princess Diana the ring. Once you have made the decision to ask the love of your life to marry you, the next big question is when and where you should “pop the question?” If your intended is born in September, the choice is easy. Sapphires are the birthstone for September. What could be more magical and special than giving the love of your life a blue sapphire engagement ring for her birthday?